Seemingly in the tradition of Captain America taking on Ironman in Civil War, and Batman vs. Superman on the big screen, it seems as if another rivalry may be on the horizon in the hollywood box-office. Creed (above) features Michael B. Jordan as the son of Apollo Creed (from the Rocky Balboa movies.) who is being trained by Sylvester Stallone’s Rocky. When I heard the premise for the movie, it seemed quite a bit silly, or like Sly Stallone just needed another check. But after watching the first trailer, my opinion was instantly turned around. 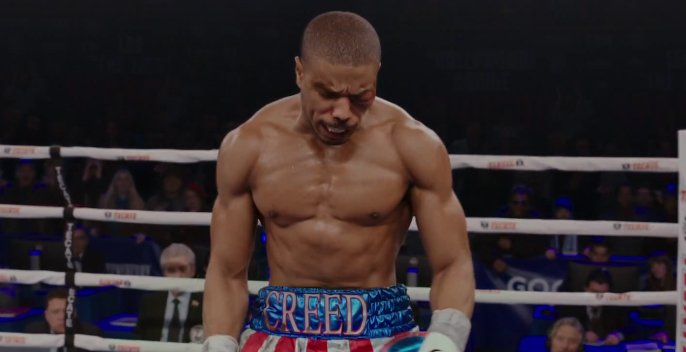 The dark and gritty semi-sequel is focused on the struggles of the young Creed, and honestly seems to be just a genuine attempt at a GOOD boxing movie, as apposed as a way to bring Rocky back to the big screen. And IN THE BLUE CORNER!!! (sorry, I couldn’t help buy type that). Southpaw was originally intended to star rap icon Eminem, but he backed out in order to focus on the soundtrack. When Jake Gyllenhaal (who’s name I still cannot spell without the help of Google) took his place after the movie Nightcrawler, people were a bit taken aback. If you haven’t seen Nightcrawler, Gyllenhaal’s character is a spindly, creepily skinny late night journalist. But when the first shots of him in Southpaw emerged, he was massive. I don’t even think Eminem would want to fight Gyllenhaal in that shape. The film itself features an interesting original story, directed by Antoine Fuqua. Sound off below as to which boxing flick YOU think will bring home the best for best boxing movie of the year.